Excerpt from U.S. Coast Guard “Proceedings of the Marine Safety & Security Council” magazine. To read Part I, please see our January 21 post. The Coast Guard investigation concluded that, as the vessel entered the water or shortly thereafter, the aft boot seal came off of the shaft housing, causing the vessel to flood. Several bilge pumps began discharging this water, but the operator did not notice this discharge, since the outlets were hidden from view and because she was focused on her tour guide duties. The flooding continued unchecked, and the working pumps didn’t have the capacity to keep up with the water entering the vessel. Since the bilge high-level alarm had not been installed, the operator remained unaware of the amount of water the vessel was taking on until it was too late. Once it became obvious that the vessel was sinking, the operator gave the order to abandon it. Tragically, that proved impossible for most of the passengers. As the vessel quickly sank, many became trapped beneath the canopy. Retrofitted vinyl windows further entrapped them. One can only imagine the horror as this scene unfolded. What began for these passengers as a pleasant family outing quickly turned into a struggle for their lives. Most lost that struggle. Only the operator and seven passengers managed to free themselves. The casualty investigation report noted the incomprehensible losses. One passenger lost his mother, father, and sister; another lost husband, son, and daughter. By all accounts, only one family unit aboard remained intact after this disaster. The picture at left (from the USCG investigation report) shows the recovered vessel. 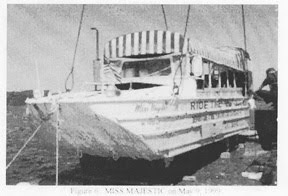 The main cause of this calamity was the owner’s failure to keep the vessel in seaworthy condition. The mechanic did not test the replacement boot seal to see if it would remain watertight in operation, and, indeed, it did not. Neither the mechanic nor owner questioned the missing hinge assembly, nor were they aware of the stress this would place on the seals. Further, the pumps that would remove water from the vessel in a flooding event were not regularly tested, and, in fact, were not all operational at the time of the incident. Finally, the high-level bilge alarm that would have alerted the operator to the flooding was not installed by the mandated deadline. It can be argued that if the owner had taken any of the above actions, this calamity may have been averted. While there is little anyone can do to ensure that a vessel owner takes his responsibilities seriously, the Coast Guard resolved to do all it could to ensure a tragedy like this one was not repeated. It convened a group of experts to develop comprehensive guidelines relating to the design, maintenance, safe operation, and inspection of these vessels. On December 11, 2000, the U.S. Coast Guard promulgated Navigation and Vessel Inspection Circular No. 1-01, “Inspection of Amphibious Passenger Carrying Vehicles,” which places special emphasis on the hinge assembly and reiterates that this component must be in place for safe operation. These exhaustive guidelines were distributed to all known owners and operators, state oversight agencies, and appropriate Coast Guard units. Full article is available at www.uscg.mil/proceedings. Click on “archives” and "2008 Volume 65, Number 2" (Summer 2008: Focus on Safety).